Stop By To See SF's New Look! I Hope You Like the New Straightforward Fitness! I’ve been working on a very intense yet exciting project for the past few weeks. Actually, I have lost track of how long I have been doing it because it is so time consuming and so focus and detail intensive. If anybody out there has built a website, you know what I am talking about. I originally built Straightforwardfitness.com (SF) back in 2008. It was a tedious and meticulous endeavor, but I was proud of my first attempt at creating a quality content-oriented fitness website. Since then I have written and self-published The Now What? Fitness eBook series. I have begun a new blog site (still in its birthing phase fitnessforwomenover50). I have built a blog site from where I sell my eBooks (Nowwhatfitness.com). I have a YouTube channel. I write this monthly newsletter. And, of course, there is the SF Facebook page. All of these are linked somewhere in this newsletter so I won't litter up this part with links. I must admit that a couple of years after building SF, I pretty much dropped that ball. What I mean to say is, I stopped adding new content except for the monthly newsletters which go into the archive page that you can view at any time. Needless to say, my SF site has gone terribly neglected. The good news is: I’M BAAAAAACK! And back with a vengeance to make up for lost time, much to my readers’ advantage! SF dot com has received a much needed facelift. No page went untouched! I am adding all kinds of new content, graphics, videos, and it’s just a much more fun site to visit now, if I do say so myself. Click on over to check it out for yourself! Please leave a comment so I know you were there! It is a work in progress and always will be. I am committed to keeping it current and fun this time around. Please contact me if you have any suggestions, comments, or ideas that will improve it in any way. I am way open to that! As I began writing this issue today, I almost started out with an apology for being a couple days behind my 15th of the month deadline. Well, in my defense I do say “around” the 15th. Lol. As that was feeling much like an excuse, it then hit me that I could link you guys to one of my pages at SF that I worked on yesterday that I liked a lot. It’s all about the obstacles that get in the way of our fitness plans. Are they obstacles or excuses? What’s the difference? Click here to check it out. Also, I have a great offer I want to shout out to all who may be interested. You see, I have a problem that I think you guys could solve. 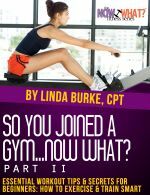 I need book reviews for my latest and I think greatest book, Joined a Gym II. Yup, I dropped the marketing ball on that one after releasing it too. So I am back on track with that; trying to light that fire again also. If you are interested, you can buy it at Amazon for a limited time offer. I will slash my price at Amazon from $2.99 to .99 cents for the next 2 weeks. This book is 2-3 times longer than my others and it’s crammed with valuable content. It’s that simple. All I ask in return is that you go to Amazon after finishing it and give it a review. It only takes a couple of minutes and it will mean so much to me. Come on my peeps! Show me some love! Just click here to go to Amazon to buy it. I believe in this book and I know it would help a lot of people. It’s packed with great info to get the biggest bang for your buck from your time in the gym. I appreciate your support more than you can know! Alrightie then! I hope you guys enjoy the new and improved SF site. I am enjoying its remodeling and look forward to building it further. In the meantime, SF’s sister site, my new blog site at fitnessforwomenover50.com. has taken a back seat as I have focused all my attention on getting SF going again. But hang in there ladies! I will pick that ball back up super soonly! All this because I love you guys and want to help you live the healthiest and happiest versions of your awesome selves as possible! PS Just to show my appreciation to you wonderful peeps for sticking with me and reading my stuff and everything, I am going to give you a BONUS tip today. Click here to get the truth about how to fight those stubborn problem areas! Be sure and read to the bottom of the page for a link to videos of exercises to help! This month's featured exercise is a Bench Dip. No. That is not a new flavor of ice cream. It is, however, great for the triceps. You know, the part of the arm that keeps waving long after you've stopped. Oy. Do these. It will help. I promise. Preparation: For this exercise you will need to place a bench behind your back. With the bench perpendicular to your body, and while looking away from it, hold on to the bench on its edge with the hands fully extended, separated at shoulder width. The legs will be extended forward, bent at the waist and perpendicular to your torso. This will be your starting position. Execution: Slowly lower your body as you inhale by bending at the elbows until you lower yourself far enough to where there is an angle slightly smaller than 90 degrees between the upper arm and the forearm. Tip: Keep the elbows as close as possible throughout the movement. Forearms should always be pointing down. Using your triceps to bring your torso up again, lift yourself back to the starting position. Repeat for the recommended amount of repetitions. Variations: You may put your feet as I have on another bench. This is the advanced method. If you leave them on the floor with knees bent it is the easiest. Straighten the legs for more difficulty. HEREIN LIES THE CHALLENGE: Go slow! Be careful not to drop below upper arms being parallel to the floor. Be patient and start off easy, working up to the more advanced technique as you get stronger. You can also purchase my books at most of the popular online bookstores in whatever format you may require. Please sign up for my mailing list and subscribe to my blog so that you can be informed when I post a new blog. I am a believer in less is more so don't worry about being inundated with posts telling you every time I had a snack or a new thought. On the other hand, I hope you find the wait between posts worthwhile as I plan to speak directly from my "writing" soul and I look greatly forward to it.